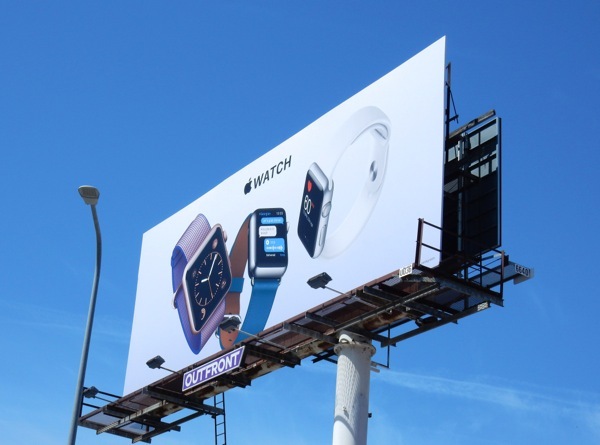 Following the news that Apple's quarterly revenue fell for the first time in thirteen years (although $50.6 billion revenue is still pretty impressive), the giant consumer tech brand is making a big push for its Apple Watch with a second wave of ads in the sprawling city skyline. 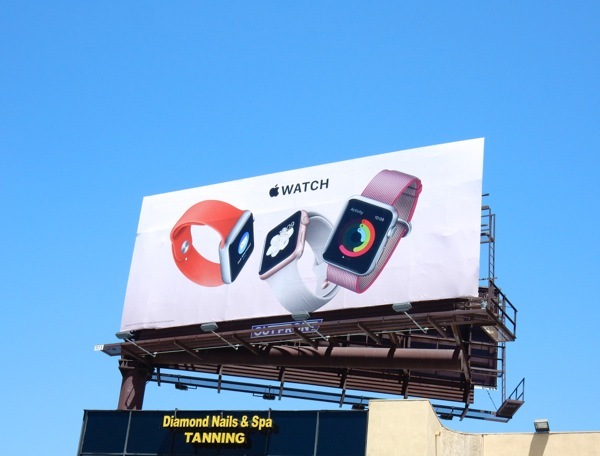 This new series of billboards features a trio of Apple Watches tumbling against a white background, similar to the recent iPhone 6s ad campaign, which is much more animated than the more static launch Apple Watch billboards from last August. 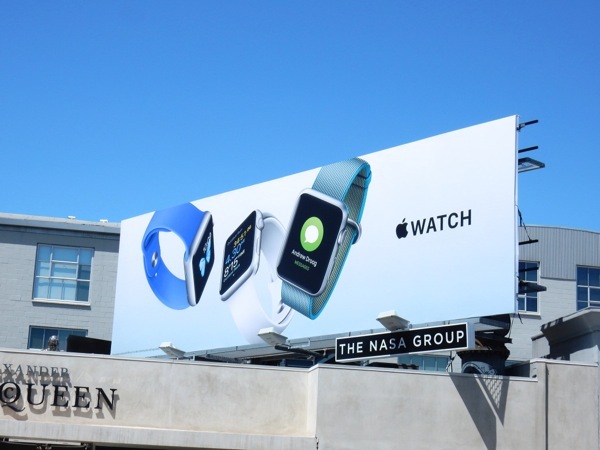 Apple hasn't released detailed sales figures for their smartwatch, so it still has to prove itself in the market, especially faced with stiff competition from the likes of Samsung's Galaxy Gear S2, the Sony SmartWatch 3 and even more focused fitness trackers like Fitbit, Jawbone and Garmin. 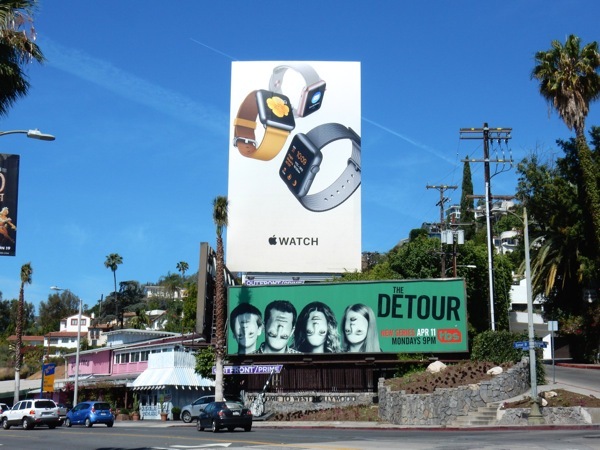 Fortunately fashion designers are embracing wearable technology at the moment in their collections, so maybe all the coloured straps and different material bands will help the watch sell as you express your style in your own way. 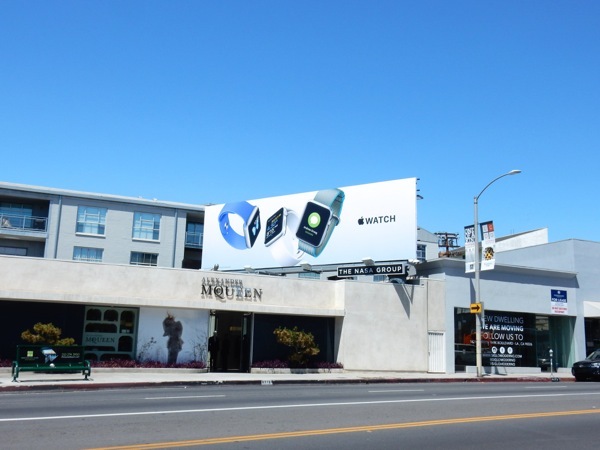 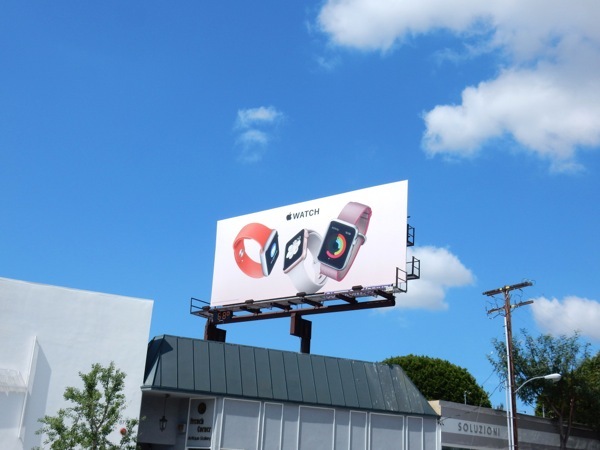 These latest vibrant billboards for the Apple Watch first started appearing in the streets and skies of L.A. on May 2, 2016, and were photographed along Sunset Boulevard, Hollywood Boulevard, Melrose Avenue, Beverly Boulevard and Pico Boulevard. 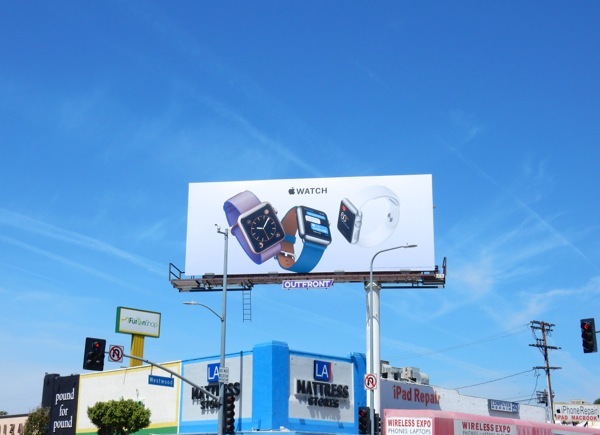 There are many more ad variations filling L.A.'s streets and skies at the moment and Daily Billboard has no doubt another wave will follow in the future (especially as we initially thought these ads were for the Apple Watch 2). Are you convinced you need an Apple Watch, or will you stick with a conventional timepiece and your existing smartphone for the time being? 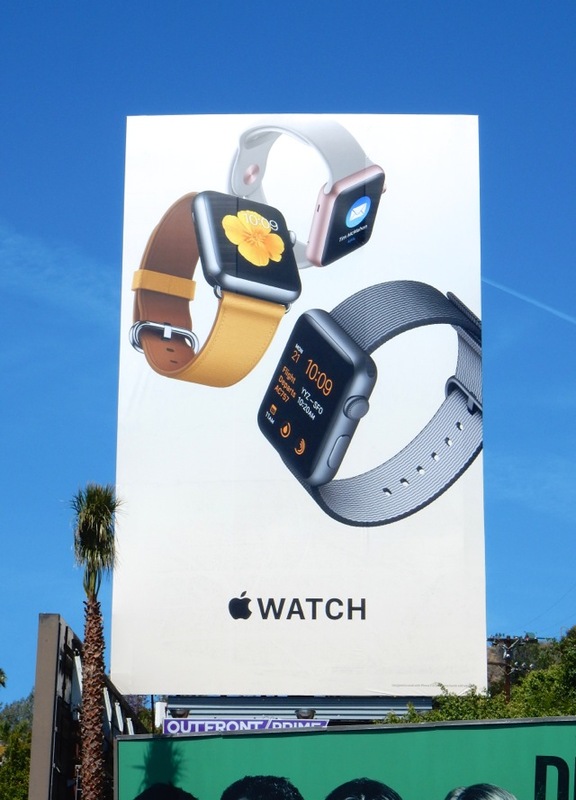 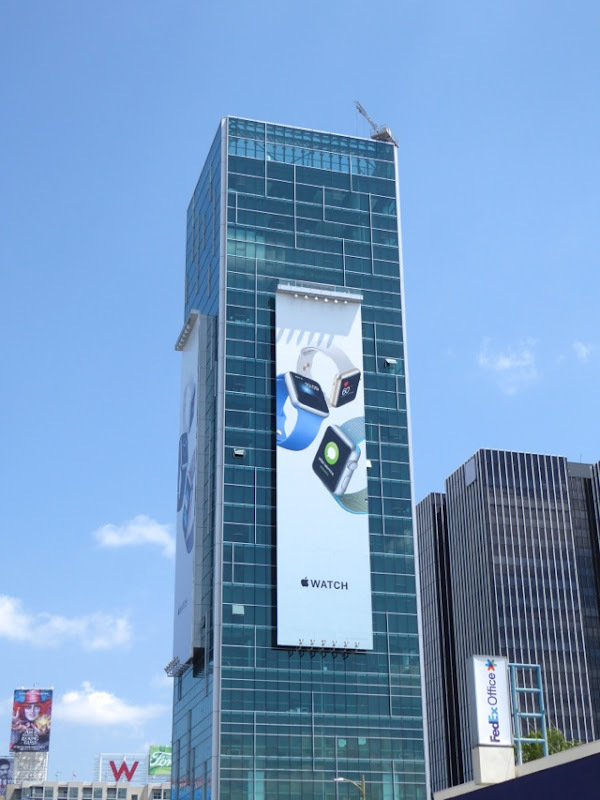 UPDATED: Here's also an example of the Apple Watch billboards covering all four sides of the Sunset Vine Tower in Hollywood on May 26, 2016.